11 Kingdom Hearts II - English Censorship in Final Mix? When you guys wrote down that rumor that EGM magazine believes it will come to the US in Fall 2008, didn't you confuse it with the original rumor of the Fall 2007 release that was proven to be false. Or did they make another article in that magazine that happened to mention that. who else has noticed that the "Naming" scene in the trailer was in english? I hate to ask something like this but it's been bugging me. My best friend said he was going to buy me Kingdom Hearts II:Final Mix+, then he tells me one day that since the game isn't in english, you need a Japanese PS2 to play it. I didn't think there was a diffrence since you can change the language setting on the PS2. I didn't want to sound selfish so I just pretended to believe him. can anyone tell me if this is true? Xiggie Buy / Sell — Welcome! What do you wanna do? I know that you can hack your PS2 somehow, and make it work, but otherwise, it won't. Xhurt - My friends are my power! Good for you, but do you have to press or to jump?? In Final Mix we use . The controls between and are reversed. Will some one just tell it to me straight! Can one can't this game be played on an American PS2 or not?! DoorToNothing — I dreamed last night... I got on the boat to Heaven! As you can see, Roxas has a checkered pattern along the sleeves' crease, and his face has been smoothed out. Also, I may have forgotten to mention that even though most of the censors from KHII were brought on to KHIIFM, the death of Axel (though synchronised with English voice-acting) retains the flames from the Japanese version. TALK - Don't worry. You might forget about me...But, with our promise, I'll come back. Cool. It doesn't matter what changes was mde to Roxas, he still looks cute! Xalxe Talk! — "Surely you must've known this was going to happen." I mean, I left you a note and everything. In the trivia section, it states something along the lines of "This (these) is (are) the last game(s) made by Nomura for the PS2. How do we know that KHIII, or KH[Insert new title here] won't be on the PS2? Has SE planned on releasing any games on PS2 lately? That's enough proof for me. But it may surprise me if they do... but that's another point to showing that they don't really care about the series since its lower quality graphics. Kingdom Hearts II - English Censorship in Final Mix? In the Kingdom Hearts II article it mentions and lists examples of how the English version of the game was censored. What version of the game is presented in the Final Mix package, Japanese or English, maybe even something different altogether? This would be something good to include in this article. 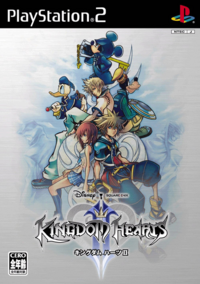 Kingdom Hearts Re:Chain of Memories, a PlayStation 2 remake of Kingdom Hearts: Chain of Memories. And this page should be called Kingdom Hearts II Final Mix. Hey have u guys signed the online petition﻿ for KH2FM to be translated into﻿ full english? if not google kingdom hearts 2 final mix petition, it should be the first one to come up. sorri got a little carried away. COPY AND PAST THIS ON EVERY KH VID!!! AS IF! The world is garbage! CRUNCH! It's true; I just signed it. It may be real but it doesn't mean those bastards at Square Enix will listen. This page was last edited on 1 October 2011, at 11:19.